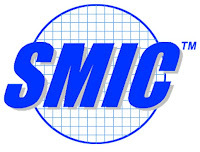 Shares in SMIC (0981.HK) (SMI.N) rose the most in a month after China's biggest contract chipmaker raised its revenue growth forecast for the second quarter to between 76 and 78 percent compared with the previous three months. The stock soared 12 percent to HK$0.42 in early trade Tuesday. Since the release of its previous forecast in April, SMIC said it had seen strong growth in customer orders, exceeding its earlier expectations, due to robust demand in the Chinese market.